After spending a few weeks getting familiar with the new Explorer edition of Google Glass, it was time to take it on the road. 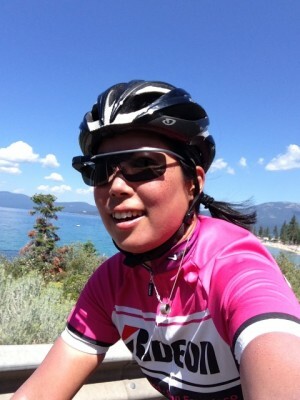 I'm an avid cyclist, so my upcoming 72-mile group ride around Lake Tahoe would be the perfect opportunity to test its video capabilities for future KQED Science stories. I was already aware of Glass' limited battery life when filming video over an extended period of time, so I was curious how it would measure up against the small, cheaper and portable sports cameras already available to consumers. My husband and I met up at 7AM with 60 other cyclists on the main drag of South Lake Tahoe to begin our ride. Our first big climb of the day was within the first 10 miles: an 800-foot ascent up to the scenic overlook facing Emerald Bay. I was surprised to find that none of the other cyclists noticed I was wearing Glass. With the tinted lenses in place, they resembled the sports sunglasses we typically wear while riding, so they were semi-camouflaged in this mode. Pedaling along at a medium-brisk pace on the flat stretch leading up to the climb, the wind produced too much noise for Glass to hear my, "Ok, Glass: Record a video" command. 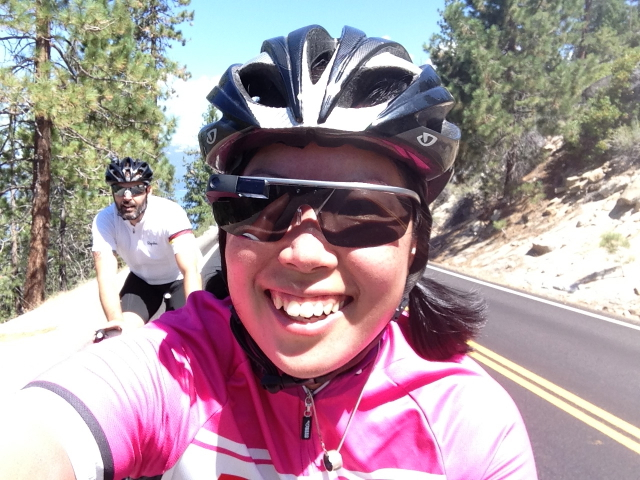 (My husband couldn't help but laugh as I pedaled along repeatedly yelling, "Ok, Glass! Ok, Glass!") I paused briefly before the climb to make one last fit adjustment, then manually set Glass to begin recording video. Watch me suffer up the climb to the Emerald Bay overlook as I chase 'carrots', or other cyclists, along the way. Select 720p HD for best viewing results. During the descent, I’d concentrate on turning my head to the right so I could capture the beautiful views of Emerald Bay. I kept one eye on the road and relied on my peripheral vision to avoid crashing, which was not too hard to do despite going close to 30 mph. Mindful of the battery's short lifespan, I'd film only in more picturesque areas and record videos in short increments. This was really easy as I'd just tap the arm with a few quick gestures, then glance briefly into the viewfinder to make sure Glass was recording. Once it was rolling, I could focus on riding and shooting video. Not having to worry about any camera mounts or cables was an added bonus. Halfway through the ride, we stopped for a snack with the rest of the group. The Glass was starting to feel a bit heavy and I noticed the effects of its unbalanced design. The viewfinder and battery are both located on Glass's right arm, and the uneven weight distribution was fatiguing, especially since I have a small nose that doesn't support Glass very well. (Customized versions that accommodated for various facial structures would be ideal, rather like Oakley's Asian fit sunglasses.) This also affected the steadiness of the video, since it wasn't perfectly anchored on my face. At another stop, when several fellow cyclists finally noticed I was wearing Glass, they pointed out that the reddish marks from the nose pads were more pronounced on the right side of my nose. I managed to film about 40 minutes of video over the course of the 6-hour ride and Glass’s battery finally gave out on the eastern shores of Lake Tahoe. One other drawback of Glass: its arms don't fold up, nor can they be tucked into my helmet vents like my regular cycling sunglasses, so I was forced to wear it for the full duration of the ride since I wasn't wearing a backpack. Filming with Glass is intuitive and the 720p HD video resolution produced good results. But its short battery life, unresponsiveness in noisy conditions and rigid design can take its toll on a user filming videos over the course of several hours. Much has already been written about how Glass can be improved. It'll need to go through a few more iterations before it usurps the convenience and cost of using ubiquitous smartphones and point-and-shoot cameras. In the meantime, Google is still rolling out its Explorer edition to other testers and has loaned pairs of Glass to film schools throughout the country. And journalists are coming up with new ways to cover breaking news stories and discussing best practices. It'll be interesting to see what emerges in the hands of creative, innovative users. Stay tuned for my next post as I continue to explore the Bay Area with Google Glass.